I am what one would call a mosquito magnet, and to make matters worse, I feel that my backyard is as mosquito infested as it gets. Some days it’s so bad, I’ve actually considered offering bats a place of refuge in return for their pest control services. When the warm weather hits, and normal people go outside to enjoy the change in seasons, I normally have to cover up in long sleeves and pants or ruin my whole summer outfit by covering it with the smells of toxic bug repellent. In late Spring, during one of my visits to The Still Point Spa in Columbia, MD, I did my typical browsing of the spa boutique items and noticed a new addition to the Toma product line-up: “botanical bug-off”. After reading the ingredients, and giving it a sniff, I decided “why not”, for only $9 it was worth giving it a shot. This short video tells you a little bit about my latest find and what happened after 15 minutes in my backyard. Since that initial “test”, I have toted the botanical bug-off around with me this summer to cookouts, waterfront dining, ballparks, pig roasts, outdoor movies, or anywhere that would require me to be outside and subject to the typical feeding frenzy mosquitoes choose to inflict upon me. Since the bottle comes with either a spray or lotion bottle top, I’ve also lathered the easy to glide-on and rub in solution on other willing participants who have been captivated by the smell of lemongrass, lavender, patchouli, and cedarwood. I must say, I have thus far been pleased with the results, and have definitely noticed the days I do get bitten, are the days I have forgotten to put on this bug-off. Though it doesn’t seem to deter gnats or flies from being a nuisance, I haven’t had to deal with the mosquito bite hives that usually sting, swell, and break-out on my body after I have been attacked by these often invisible creatures, and the days of uncomfortable scratching and itching that follow. “Maybe the mosquitoes just aren’t out the days you use it”, is what I’ve often told myself, as it was hard to believe something that smelled so pleasant was really keeping one of my worst enemies at bay. 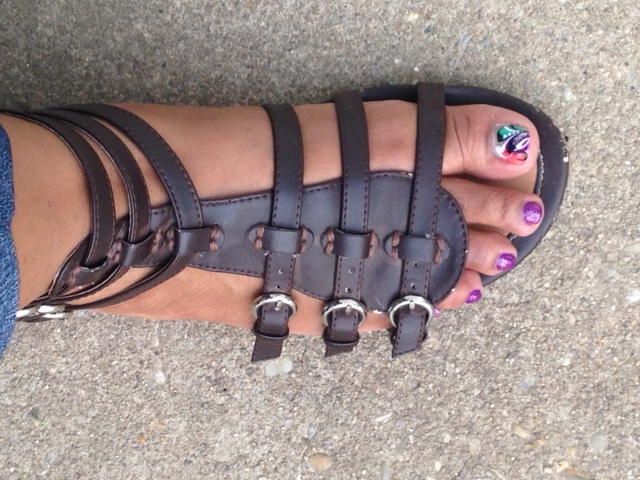 However, I knew this couldn’t be the case, as on more than one occasion, I’ve worn my gladiator sandals, and though I put the bug-off on my legs and arms, I didn’t bother to put it on my feet since I already had my shoes on. Well, wouldn’t you know it, that on all those occasions, Mr. Mosquito decided to take advantage of my vulnerability and take a bite out of whatever uncovered skin he could get to between that sandal!! So far the spa bunny is in love with the Toma Botanical Bug-Off! With proper and frequent usage, I think I can get through the summer with minimal mosquito and other bug bites, while utilizing what the label calls a “natural alternative to toxic bug repellents”. I almost hate to brag too much about the product, as I don’t want it to sell out or be unavailable when I need to restock! However, I bring you this “confession” as a way to help others who are looking for a natural bug-off solution that actually works so that you too can enjoy your summer bug bite free.